You bet your booty Charter Oak has reloaded. 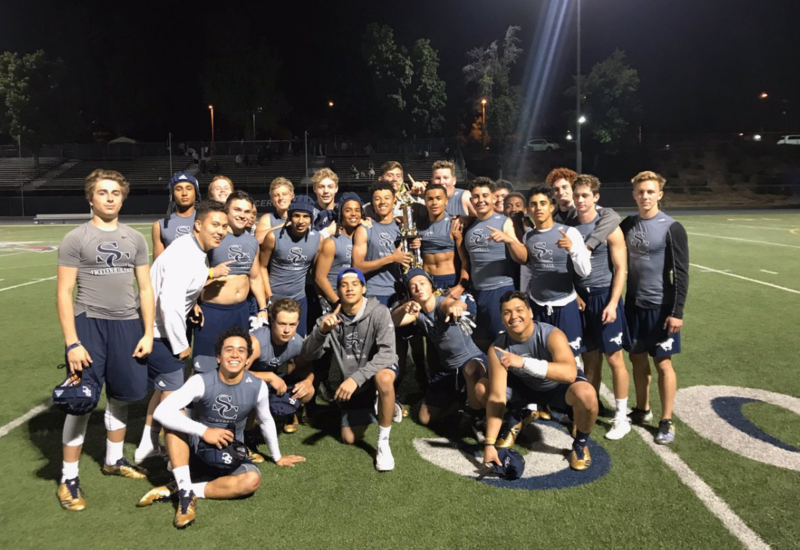 The Chargers took their own tournament on Saturday, beating Upland in the finals of the Big Lou Classic. The Chargers got a strong showing from standout receiver Jermaine Braddock, among others. Charter Oak beat Sierra Canyon to reach the finals while Upland beat Rancho Verde in the other semifinal. But wait … that’s not all. I’ve received multiple messages about a controversial ending to the final game. The Scots are not happy that there was reportedly a rule change or a rule in use that allowed CO some extra plays/time. I wasn’t there, so any community help is appreciated. According to one message, The Scots were so sour they offered to send over a contract for a real game in pads in fall. Interesting. Big Lou Classic at Charter Oak … Saturday, 8 a.m.
Arroyo, Ayala, Bonita, Charter Oak, Chino Hills, Garfield, Corona del Mar, Damien, Lakewood, Valley View, Eisenhower, Calabasas, La Salle, La Serna, Loyola, Mira Costa, Pacifica, Palmdale, Granite Hills Paloma Valley, Rancho Verde, Quartz Hill, Santiago, Sierra Canyon, Upland. Raeshawn Roland of Arcadia, who will play next season at Dixie St., capped off his prep career by catching a 18-yard touchdown pass with 43 seconds left to send the North to a 22-18 win over the South in the North/South All-Star Game at Covina District Field on Saturday night. North MVPs were: Richie Schroeder (Monrovia) and Amir Davis (Muir). South MVPs were: Jordan Thomas (Norwalk) and Andrew Camargo (Bishop Amat). Sierra Canyon came to the Valley and left with a win again (last year’s semis vs. Charter Oak). The Canyon knocked off Oxnard to win the Light It Up tourney at La Salle. Still awaiting word on how the locals did. FYI, Sierra Canyon is earmarked for D-3 in the new CIF football playoff division preview that I saw.